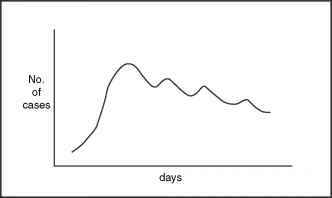 Observations are often organized in the form of an epidemic curve in which the number of cases is plotted against a time axis. This disease pattern is an important factor in differentiating a natural outbreak from an intentional event. A point source epidemic is an example of a temporal disease pattern (Figure 10.1). In this case, susceptible individuals are exposed more or less simultaneously to one source of infection; there is a sudden peak in the disease incidence and quick return to normal. Food source outbreaks tend to be point source events. A propagating outbreak, in contrast, is typical of contagious infections like foot-and-mouth disease or pneumonic plague, in which cases continue to occur and each new case may infect others to continue the epidemic (Figure 10.2). In most naturally occurring outbreaks, other than those that are foodborne, numbers of cases gradually increase as progressively larger numbers of people, animals, or plants come in contact with other patients, animals, fomites (inanimate objects capable of carrying infection from one infected animal to another), and vectors that can spread disease.19 Epidemic curves may also indicate the time of exposure. 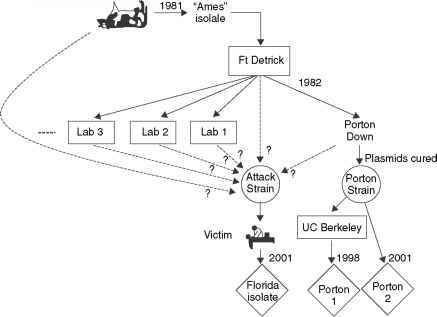 FIGURE 10.1 Example of a temporal pattern of disease typical of a point source epidemic such as a foodborne infection. Susceptible individuals are exposed more or less simultaneously to one source of infection: there is a sudden peak in the incidence of disease and a quick return to normal. FIGURE 10.2 Example of a propagating outbreak involving a contagious disease such as foot-and-mouth disease virus infection in which new cases continue to occur and each new case may infect others to continue the epidemic.